79% of consumers use their smartphones to help with shopping, according to Econsultancy. This is because today, traffic is driven by mobile. In fact, 1 in every 2 millennials in the US has downloaded a mobile shopping app. With the evolution of smartphones, tablets and other devices, your current and potential customers are never far away. In fact, if you look at the people around you, mobile truly seems to be at the center of their universe. On the other side, companies are continuing to adopt a mobile-centric approach when selling to customers. Just as mobile is at the center of our customers’ worlds, we need to continuously be sure that our customers are at the heart of our mobile strategy. Mobile has the ability to connect our customers with our brand 24 hours a day, 7 days a week. Real-time marketing with mobile is essential to our success! And just when you think you’ve figured out how to market to the millennial audience, here comes Generation Z, defined as those born between 1996 and 2010. Gen Z has never known a world without smartphones and social media, so imagine how quickly marketers need to capture their attention, and keep them engaged! For Generation Z users they are less eager to share their lives publically with the world. Rather, they prefer a more anonymous approach like Secret and Snapchat which don’t leave a permanent trail of their communications. So how do we approach our new and old users for the ultimate customer experience in mobile marketing? Here are tips to get you started. In our Digital Customer Engagement Index, 92% of companies had an app (Android/iOS or both) with 24% of Android apps that asked to send push notifications. But only 17% actually sent push notifications throughout the 4-week study. More so in Italy, 82% of the companies asked permission to send push notifications but only 18% sent any push messages. It’s not enough to just have an app, you need to use it to its full potential! 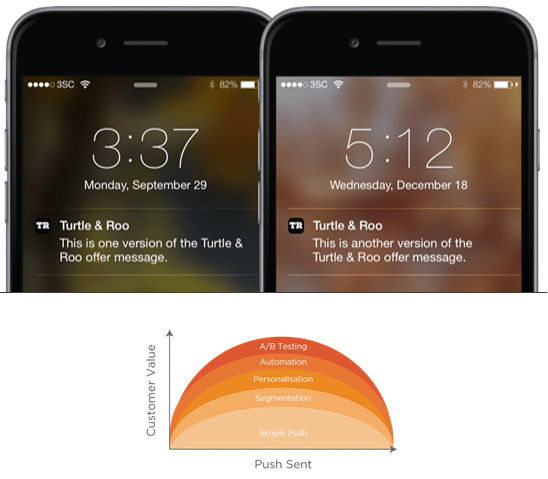 Push notifications are there to be used as a means to engage with your customers. Brands need to take full advantage with the tools at their disposal.Over the past three years, we’ve witnessed a massive shift in the way people consume digital media and shop online; we are living in an app world. According to Smart Insights, 89% of people’s time spent on media is through mobile apps, while the remaining 11% of their time spent on media is through the mobile web. With statistics like these, it’s important to engage your customers where they spend their time, and are more likely to engage with your brand. 2. Consider the customer value lifecycle stage Another important aspect of your mobile strategy is to consider where your customer is in their lifecycle with your brand. For example, if you are looking to convert a subscriber to a customer, perhaps send an abandoned cart notification, or send a “limited time offer” SMS message. Location-based offers, confirmation notices, and promotional messages are key for the engagement stage of the customer lifecycle. And to retain current customers, consider sending birthday messages, loyalty program rewards, and reminders via mobile.The important point to keep in mind is that push notifications are they to strengthen your relationship with your users. The more you get to know them the more you can personalize your messages. The idea is to plan your campaigns in order to keep your users active and loyal. This is where A/B testing comes in order to identify which design and content is best suited for your customers. Segmentation will allow you to send test notifications to certain segments in order to discover the winning combination which you will send to the rest automatically. 3. Connect your data: provide sign-in option It is highly beneficial to offer your customers the option to sign into their accounts via your app. This will ensure you can sync data you have on that customer, from other channels or touch points. Which then allows you to offer the right message via the right channel, depending on which channel is most effective for your customer. Our Digital Customer Engagement Index showed that 81% of Android apps offered customers the option to sign into an account and 10% made it mandatory. The sign-in feature not only collects details of the customer to enable more individualization of future interactions but it also acts as an additional channel for communication via email, SMS and social media. However, be sure to make the sign-in optional so that you will not lose the users who do not want to sign-in. 4. Put your customers in control Get more relevant with your marketing as today, customers are in control. They expect an immediate response to their inquiries, and companies are challenged to keep up. As my colleague Ricardas Montvila, Head of Solutions Consulting comments: “customer-centricity is at the core of individualized marketing. It is rather simple to deliver highly customized messages to the consumers, but the difficulty is in being consistent across all channels.” The idea here is for brands to available for their customers, across multiple channels, but especially mobile. In order for your customer to feel in control you need to make sure to empower them with it. This is applicable to giving them choice when it comes to sign-in options or push preference centers. People are more receptive if they feel the cards are in their hands.Your customers should be able to choose via the channel they want to communicate. It is important to monitor closely the device they use as well as their behavior. By doing so you will develop a 360 degree picture of your customer’s journey and improve the buying process as well create a more enhanced and beneficially journey for your customers. Final Thoughts Not only has mobile become an essential component to your customer’s everyday lives it has also become a pillar in marketing. Most brands are taking advantage of the multiple ways to smartly use mobile marketing and are hitting their target group, while others are clearly not there yet. These tips should be at the foundation of your mobile marketing strategy in order to create remarkable customer experiences and successful results. To find out more about our mobile marketing services click here.